My sister in-law’s grandmother (Sweet Betty) makes these incredible M&M cookies. Whenever there is a celebration at their house, these always seem to be on the kitchen counter. They’re not hard and crunchy like so many M&M cookies — these are really light and soft. It’s like eating a muffin top with M&M’s They’re simply irresistible, and why wouldn’t they be, she been making them for over 30 years. Cream shortening, sugars ,eggs, and vanilla. Mix in dry ingredients and combine with creamed mixture. Drop by teaspoonful on un-greased cookies sheet. Flatten to no more than 2 inch diameter. 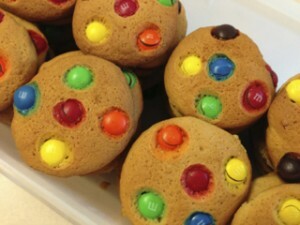 Decorate with 4 to 6 M&Ms per cookie. Candies will crack after baking. Bake at 375 degrees for 8 to l0 minutes. Makes 2 to 4 dozen cookies depending on size of your teaspoonful.